For a long time, the media, the industry and even fans have constantly paired Banky W with his female singer, Niyola. However, news of his engagement to actress, Adesua Etomi broke the internet a few days back and rumors of relationship with Niyola went with the wind. 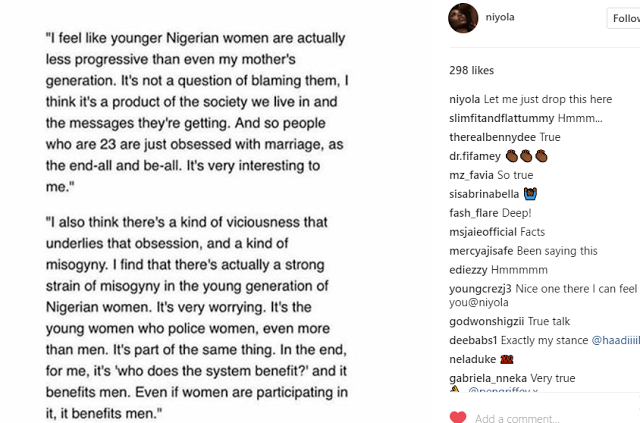 ‘I feel like younger Nigerian women are actually less progressive than even my mother’s generation. It’s not a question of blaming them, I think it’s a product of the society we live in and the messages they are getting. And so people who are 23 are just obsessed with marriage as the end-all and be-all’.